Get all the goodness of gluten free oats the easy way, any time, any place. This drink is made with whole grains, including the soluble fibre oats are famous for. The satisfying oaty flavour is subtly balanced with pure mountain spring water and a touch of cold-pressed sunflower oil. Comfort you can drink. Natural Spring Water, Organic Pure Oats (11%), Organic cold-pressed Sunflower Oil, Sea Salt. Use with cereals, add to coffee or tea, add to a smoothie or shake, or even bake with it, include it in lighter pancakes, curries and cream soups. 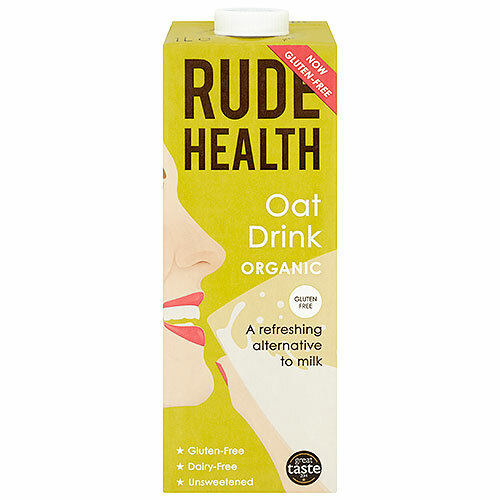 Below are reviews of Rude Health Organic Oat Drink - 1 Litre by bodykind customers. If you have tried this product we'd love to hear what you think so please leave a review. 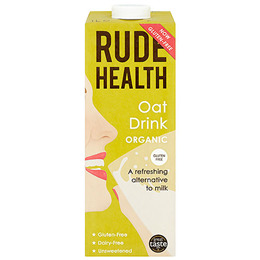 This drink is made with whole grains, including the soluble fibre oats are famous for. The satisfying oaty flavour is subtly balanced with pure mountain spring water and a touch of cold-pressed sunflower oil.